The lab activity was developed by Jeff Lockwood and Sarah Hill of TERC and Alison Mote of the Ann Richards School for Young Women Leaders for the EarthLabs project. In Part A, students learn about the ship they will board for their journey to the Southern Alaska coast: the JOIDES Resolution. 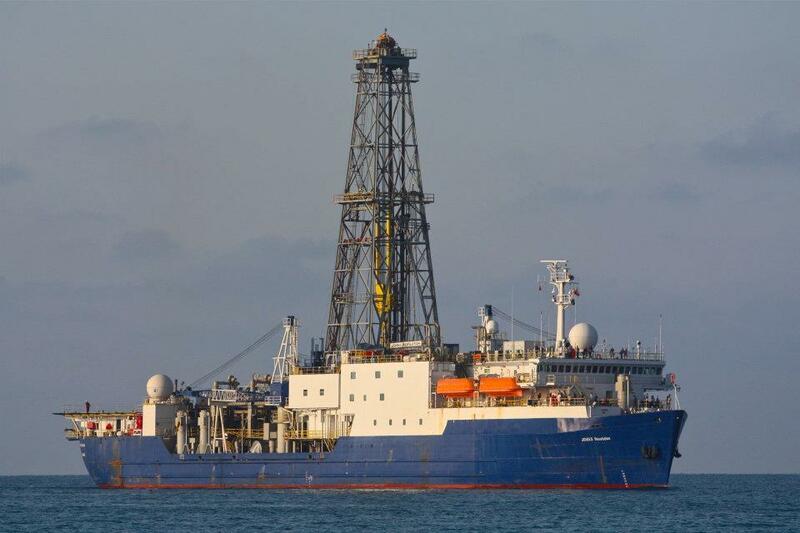 How is it equipped to drill into the ocean floor and find clues about past climate? In Part B, students do a career matching activity and meet the crew of scientists who will gather the core data for their final project. In Part C, students learn where their voyage will take them and why the sites for drilling cores were chosen. What is the IODP is and what role does it play in helping us understand our planet's history? What JOIDES Resolution instruments and technologies allow scientists to collect data and extract relevant data from the sediment cores and bore holes? What set of scientific and engineering careers/training are required in order for the JOIDES Resolution to accomplish its science and mission goals? How do scientists work together to accomplish the expedition's science mission? Evaluate how scientists carry out scientific research, both individually and as members of a team. Detailed overview of what students will do in each lab activity, how long it will take, and what materials are required to complete the lab. Students learn about the features of the JOIDES Resolution, one of the premier science research vessels in the world. They watch a video to learn about some of the tools and laboratory facilities on board. Then students fill out a table that asks them to note the purpose/function of each major part of the ship, and an interesting fact or two about them. Students play a career matching game to explore the different kinds of jobs required for a successful research expedition on the JR. Although many of the crew are scientists of one kind or another, there are other important roles and jobs included in the sample of 12 people chosen for the activity. The emphasis here is placed on team work and collaboration. The activity also drives home the point that it takes a well organized, hardworking team, coupled with sophisticated engineering and applied technologies, to gather core data to analyze for clues to past climate change. In Part C: Where Are We Going? Students listen to lead scientist Ken Ridgway explain why the scientists of Expedition of 341 chose the sites students will visit in the Gulf of Alaska. The major goals of the expedition are revealed and provides the context for the data analysis that students will engage in for the rest of the module. Download and print files needed for each lab activity, including images, data tables, and Stop and Think questions. Right-click (Win) or control-click (Mac) the linked text below and choose File > Save As... to save files to your computer. What you need to prepare ahead of time, and general recommendations for classroom implementation, as well as guidelines and facilitation tips for leading class discussions. Read through the lab and teacher resources BEFORE implementing them with your students. Print out any paper-based materials before starting the lab. Have students keep a journal or notebook to record all of their notes, questions, and findings. - The career cards should be printed front-to-back in the order that they appear in the document. - There are two sets of cards; the first set of cards contains a job title and description with key words associated with each job on the back of the card. The second set of cards shows a picture of each scientist or crew member and images of equipment and/or tools used for their jobs on the ship. Print and cut the cards in advance to save time. In Part A: Engagement Activity - To introduce students to the International Ocean Discovery Program, begin the lesson by showing the Introduction to IODP video. Explain to students that in this EarthLabs module they are going on a voyage with the scientists of Expedition 341 to uncover clues about what the climate was like in the past in southern Alaska. Then students watch a video to learn about the tools and laboratory facilities on board the JOIDES Resolution that make deep-sea drilling possible. While they watch, students take notes in a table and describe the purpose of various parts of the ship, and note any interesting facts about them. If you show the video from your computer, pause the video at one or two minute intervals so students can take notes and ask questions. If students watch the video on their own device, tell them to watch the video several times if necessary. Wrap Up: Have a discussion with students about the facilities on board the JR. How would they like to spend two months aboard the vessel? Ask students if anything surprised them about the tools used to obtain deep-sea cores. In Part B: Students learn about the different scientific jobs required for the success of Expedition 341. Although many of the scientists on board the JR have backgrounds in Earth science, the point of the exercise is to show that it takes a team of experts in a variety of occupations in close collaboration to insure a smooth running ship and research endeavor. In Part C: Where Are We Going? Students watch a video in which the geologic objectives of Expedition 341 are explained by geologist, Dr. Ken Ridgway (Purdue University). In the video, Dr. Ridgway explains how the drilling sites are related to geologic processes on shore in Alaska and how climate and mountain building/tectonics are related. He also explains how he became interested in a career in science and offers a personal perspective on careers in science. Some of the geologic terms in Part C and in future labs might be new to students. You might choose to have students write down new vocabulary in their notebooks and define these bolded terms in their own words. The video of Dr. Ridgway is ~ 9 minutes long. You may want to show this video in segments. The scientific objectives are explained from 0:00 min. – 3:04 min. ; preliminary findings and climate – mountain belt interactions are explained from 3:05 – 4:04 min. ; background interest in science, personal perspective, and future work is discussed from 4:05 – 8:45 min. 1. Working in groups of 2-3, students should obtain a set of career cards. Explain that each set of cards contains two categories: "Job Descriptions/Key Words" and Scientist/Crew member cards, which show pictures of Exp. 341 scientists/crew members and images of tools and equipment used for their jobs. 2. Students should begin by reading the Job Description cards. Instruct them to set aside the job description cards that sound the most interesting to them. They should summarize the job descriptions of their top three choices in column 1 of their table. Students can create a table in their notebook or use the handout provided. 3. Next, students will watch a number of interviews of scientists. Depending on computer access, students can do this individually or in small groups. Their task is to match the scientist trading card to the appropriate job description, based on information gathered from the video. Students should fill in column #2 of their table when they think they have found the scientist or crew member that represents their "most interesting" job choice(s). 4. Provide students with an answer key so they can check their work. There are 12 scientists and other staff members of theJR represented in the career sample. In the interest of time, it might be best to either assign each student a few staff members to work on or make a contest out of it: Working individually, who can identify the most staff members in a period of 20 minutes? Wrap Up: Take a poll of the students: Which job would you like to have on the JR? Suggestions for how to use Student Notebooks for Lab 1. The following items are suggestions for inclusion in optional printed student notebooks. The materials are linked in the Printable Materials section, above. There are several options for assessment of student understanding of material introduced in this lab. Choose from the following list, or create your own assessments. Assess student understanding of topics addressed in this investigation by grading their responses to the Stop and Think questions. Teachers may want to collect and grade the table in Part B. A list of the Next Generation Science Standards (NGSS) supported by this lab. For more on careers associated with deep sea drilling, see Marine Careers. The Earth Exploration Toolbook Chapter Cool Cores Capture Climate Change walks users through techniques for analyzing ice cores from the Andrill project in Antarctica. The Earth Exploration Toolbook Chapter Climate Clues from Deep Sea Sediments focuses on reconstructing the Paleocene-Eocene Thermal Maximum (PETM). Students access Integrated Ocean Drilling Program (IODP) core data with Virtual Ocean software, identify appropriate bathymetric depths for finding desired marine sediments, locate potential core, log, and seismic data to map the marine sediment biostratigraphy, and download and examine ocean floor core data from the CHRONOS data portal to search for a specific planktonic foram that prefers near-surface (warmer) ocean conditions. The Earth Exploration Toolbook is a collection of computer-based Earth science activities. Each activity, or chapter, introduces one or more data sets and an analysis tool that enables users to explore some aspect of the Earth system. Step-by-step instructions in each chapter walk users through an example-a case study in which they access data and use analysis tools to explore issues or concepts in Earth system science. In the course of completing a chapter, users produce and analyze maps, graphs, images, or other data products. The ultimate goal of each activity is to build user's skills and confidence so they can use data to conduct their own investigations of the Earth system. Lab 2: Coring Is Not Boring! Lab 5: (Geologic) Timing Is Everything!